The Americans With Disabilities Act (ADA) makes it unlawful for an employer with 15 or more employees to discriminate against a qualified individual with a disability. 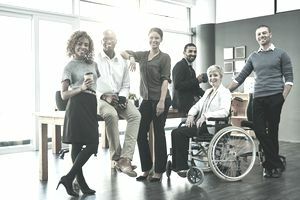 The Michigan Persons with Disabilities Civil Rights Act, for example, which is similar to the ADA in many respects, covers employers with one or more employees. You need to make yourself aware of the laws in your city, state, or country so that you are up-to-date on how to avoid discrimination in your interaction with employees and potential employees. This article addresses a number of disability law issues relevant to employers. Make sure that you consult with your employment law attorney for your location to ensure that you are up to speed on any legislation which may affect your actions as an employer. Undoubtedly states in addition to Michigan and other jurisdictions will have their own requirements in addition to the Federal law. The ADA applies to a person who has a physical or mental impairment that substantially limits one or more major life activities (like walking, standing, kneeling or breathing). Examples include individuals who have physical conditions such as epilepsy, diabetes, severe forms of arthritis, hypertension, or carpal tunnel syndrome, as well as individuals with mental impairments such as major depression, bipolar (manic-depressive) disorder, and mental retardation. Alcoholics are covered as well as recovering drug addicts. An individual with a disability must be able to perform the essential functions of the job, with or without accommodation, in order to be protected by the ADA. The individual must also be otherwise qualified for the position. This means that an individual must be able to satisfy the job requirements for educational background, employment experience, skills, licenses, and any other job-related qualification standards. What qualifies as an essential function? the degree of expertise or skill that is required to perform the function. The ADA makes it unlawful to discriminate in all employment practices, including recruitment, hiring, firing, pay, promotions, job assignments, training, leave, layoffs, benefits, etc. In addition, the ADA prohibits an employer from retaliating against an applicant or employee for asserting his or her rights under the ADA. The ADA also makes it unlawful to discriminate against an applicant or employee, whether disabled or not, because of the individual's relationship or association with an individual with a disability. Further, an employer is also required to provide a reasonable accommodation if a person with a disability needs one in order to apply for a job, perform a job, or enjoy benefits equal to those offered to other employees. An employer does not have to provide any accommodation that would pose an undue hardship. What is a reasonable accommodation? Reasonable accommodations are adjustments or modifications provided by an employer to enable people with disabilities to enjoy equal employment opportunities. allowing an employee to use accrued paid leave, and providing additional unpaid leave once an employee has exhausted all available leave. What is an undue hardship under the ADA? size, type and overall financial resources of the employer. If providing a particular accommodation would result in undue hardship, an employer should consider whether another accommodation exists that would not. Can an employer consider health and safety issues in deciding whether to hire an applicant or to retain an employee with a disability? Yes. The ADA permits an employer to require that an individual not pose a direct threat to the health and safety of the individual to other employees, or to the public. A direct threat means a significant risk of substantial harm. When can an employer require a medical examination? The ADA prohibits medical examinations before a job offer was made. After a job has been offered and prior to the start of employment, a medical examination may be required and the job offer may be conditioned on the exam results. An examination must be required of every applicant in the same job category. If the employment offer is withdrawn due to medical findings, the employer must be able to show the rejection was job-related and a business necessity and that there was no reasonable accommodation that would enable the individual to perform the job’s essential functions. In light of the increase in employment lawsuits, effectively documenting this entire consideration is strongly recommended. if required by some federal law or regulation. In summary, while the ADA can cause employers to pause and worry about compliance, if you have done your level best to operate within the requirements of the law, you are treating employees and potential employees with fairness and justice for all. And, isn't this your core concept of you as an employer? Disclaimer: Please note that the information provided, while authoritative, is not guaranteed for accuracy and legality. The site is read by a world-wide audience and employment laws and regulations vary from state to state and country to country and from year to year. Please seek legal assistance, or assistance from State, Federal, or International governmental resources, to make certain your legal interpretation and decisions are correct for your location. This information is for guidance, ideas, and assistance. Furthermore, it is not comprehensive coverage of the subject. Melvin Muskovitz is a member of Dykema’ s Labor and Employment Practice Group and represents employers in federal and state courts, and before administrative agencies.